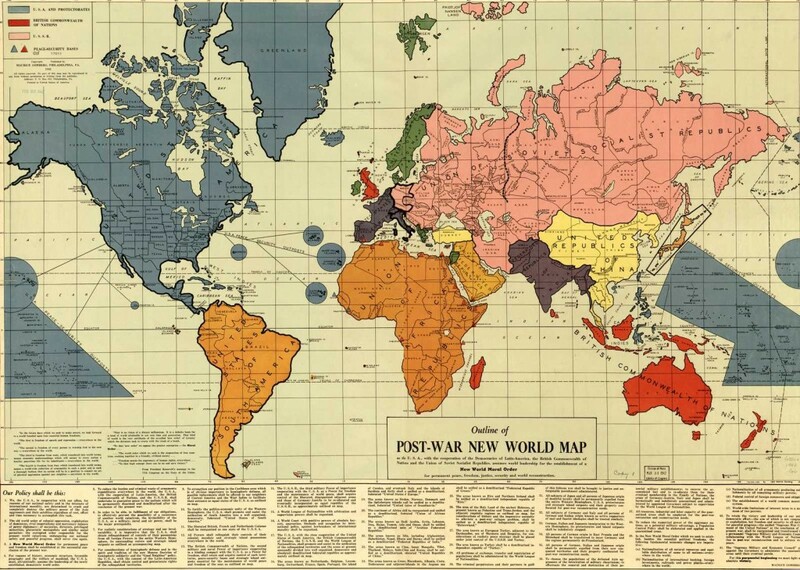 This 1942 New World Order map attributed to Maurice Gomberg is interesting in that it gives a snapshot of emerging thought about the United States and its sphere of influence after World War II. This is borne out by entries in wartime portion of the Diary of Francis Burton Harrison, who was an adviser in the Commonwealth government-in-exile. His wartime diary commences in May, 1942 all the way to August, 1944. I asked Quezon how he got on with his Dutch colleague on the Pacific War Council. He said he had nothing much to do with him. Asked whether he thought the Dutch would have their empire restored after the war, he said he didn’t know–but it it were, it would only be a matter of thirty years at most. I was invited to attend the Cabinet meeting yesterday to hear Bernstein explain his plan and program for the new office of “Special Service” (propaganda) which he is organizing for Quezon. It was a one man show. Quezon made a long and rather astute statement to let Bernstein understand that he had changed his mind as to the scope of the undertaking. Bernstein was told to read his plan of organization and was stopped after the opening paragraphs. It was a scheme for a Malay Federation to include the Philippines, the Dutch East Indies, Siam and French Indo-China. 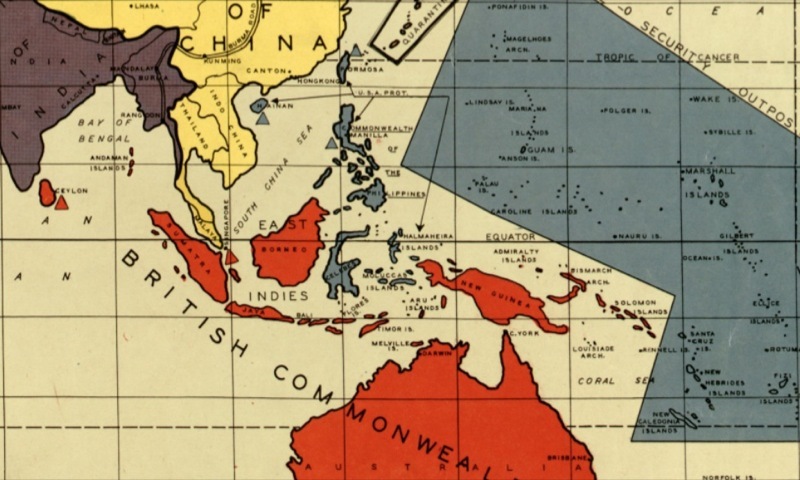 Quezon explained that if such a scheme were ever proposed, it would have to come from the Javanese, or others of the countries concerned –otherwise it would look as if the Filipinos were reaching out after an empire. Quezon said he would not mind if Java were the seat of government, of such a federated state –but that it was no time to mix in such questions now! Such a move would only provoke ill feelings among allies. Elizalde says that Quezon watches the faces and studies the expressions of everybody in a group which he is addressing and added that Quezon must have noted the strained and worried countenances around him during this very interesting and, perhaps, momentous conversation. On my return to Washington, I made an especial (verbal) report to President Quezon on this situation. It is a subject in which he is most particularly interested. For some years, underground conferences between him and “leaders” of the Javanese (who are erroneously supposed to be completely docile–like the two hand-picked specimens the Dutch brought with them to Mont Tremblant). They seem to have some sort of a vague ambition to recreate the old Malay Empire of long ago–to include the Netherlands Indies and the Philippines and parts of British North Borneo. Quezon did not seem much impressed by the determination of the Dutch to hold on to their rich empire. His comment was that the last time he talked to the Javanese leaders a few years ago, they were all pro-Japanese. He told them this was a very great mistake; for while they could get rid of the Dutch any time they tried, they would never of their own efforts, get rid of the Japanese, once the latter were established in the East Indies. On my own return from the two weeks session of the Institute of Pacific Relations at Mont Tremblant, Quebec, I reported to Quezon at the Shoreham. He was deeply interested. Said the terms of the proposed settlement by Holland of the Indonesian question didn’t really matter–the Indonesians could get rid of the Dutch any time they wanted. Quezon had seen Panikkar, the Indian, whom I met at Mont Tremblant. Had been very deeply interested. Panikkar told him the Indians want independence–not Dominion Status; that the Moslems also want it, though they demand safeguards as a minority. Quezon suggested to him the federal system like the United States, with a lower house representation based on population, and the upper house giving equality to states. Panikkar replied that is what they propose to do. That they must retain all of Occidental influence they now have and not just lapse into their former Oriental luxury and magnificence. England is afraid to let go just now–the Indian army is chiefly one of professional soldiers, and could easily turn against England if things went badly. But Quezon told me he had abandoned all idea of taking any hand in the freeing of India and of Indonesia and in the forming of an Indonesian Empire, made up of a union of the Philippines and the Netherlands Indies. He had decided to concentrate entirely on the problems of his own people, though he would be “the happiest man in the world” if the other projects became a reality. Said it would take fifty years for an Indonesian Empire to become strong enough to withstand China or Japan. He had told President Roosevelt of his decision to concentrate on the problems of his own country and not take part in the other schemes, and that this statement “made Roosevelt jump.” He added that the good will or support of Great Britain as well as of the United States would be needed in either eventuality. Thought Hong Kong should not be given back to China, but that the English should pay China the value of the barren island as it was when ceded to them, because of the disgraceful circumstances in which they got it. Panikkar told Quezon that the Burmese were going to fight on the side of Japan! Quezon is now going to try to get through Congress a joint resolution that the Philippines are and of right should be independent, etc. The next day I was with him to receive David Bernstein, his new “Special Services” (i.e., advertising) man. Bernstein is full of clever schemes for publicity over the radio and movies. Quezon conveyed to him his decision to drop the “free India” and “free Indonesia” issues for the present. Said he had been with Harry Hopkins this morning communicating to him the same decision. (Harry Hopkins probably let Lord Halifax know this at once–thus removing a cause of irritation if not worse!) Told Hopkins he must concentrate on the affairs of his own people, and was beginning to prepare his plans for the Joint Resolution for Independence. Bernstein commented that this would be a very powerful weapon of psychological warfare; also conveyed a request of Time for a reply to an article from Buenos Aires–German sponsored propaganda purporting to come via Japan from the Philippines, in which eulogistic descriptions were given of the present peace and contentment in the Philippines. Quezon dictated a brief response quoting General Tanaka’s recent report on his tour of the Philippines, in which the situation of public order was described as “not very satisfactory.” Quezon added that naturally it was not satisfactory to the Japanese since the Filipinos were still fighting vigorously. They had tasted freedom such as the Japanese themselves had never known at home and did not mean to give it up. The idea of a Pan-Malayan Union predated World War II; it would resurface in the postwar era (in particular there is a book by the controversial Eduardo Martelino, see the opening chapter, Vision in Malaysia from 1959, which seems to be more familiar to Malaysian than Filipino commentators) whether as Maphilindo or, eventually, as an antecedent for ASEAN. For additional background, see Indonesian and Dutch Reactions to the Philippine Struggle for Independence by Adrian P. Lapian and Visions of Empire: Changing American Perspectives on Dutch Colonial Rule in Indonesia between 1920 and 1942 by Frances Gouda. The reader will also notice mention of Indochina –today’s Vietnam, Laos, and Cambodia– which brings up an interesting point of contending points of view between the Americans and the British and the French. At the time the map above was made, the American position seemed to be to deny France a return to Indochina. For a survey of the official view see Vietnam Footnote: The Pentagon Papers and Roosevelt’s Anti-Colonialism—by Mark Arnold. However, FDR seems to have reversed his trusteeship plan for Vietnam: see Roosevelt, Churchill, and Indochina: 1942-45 by Walter La Feber. See also Franklin Roosevelt and Indochina by Gary R. Hess. There are also interesting views on China put forward by Filipino leaders –as well as by others, in a conference attended by representatives of the Allied nations– as recounted by Harrison in his diary. Quezon thinks this is a business war, caused by slavish imitation by Japanese of the Western powers’ methods of monopoly. If the Japanese had not closed the open door in China, there would have been no war. It was totally needless, in any case, for the Japanese could have undersold all commercial rivals with all of her own products in China and she had already regained for China control over her own customs administration. If the “open door” had been maintained, the United States could then have held their Chinese market only on petroleum and tobacco. In Japan in 1937, Quezon met members of the House of Peers and of the Diet who were opposed to the militarists —not so now. One of the Peers who was speaking of the recent Coronation said it was the last, as a religious ceremony with all the “Son of Heaven” cult. Quezon says he is never entirely at his ease in conversations with Japs —they have been until recently, for too many centuries isolated from the rest of the world. Thinks it is a mistake to assume the Japanese are naturally an Empire and the Chinese not; on the contrary, the Chinese have always been imperialists when they were strong enough, and the Japanese only recently so. China in the past tried to conquer Japan. If the Chinese now argue that the aid promised by the United States to China has not been satisfactorily supplied, he would reply, if he was an American, that the Chinese got us into this war anyway. Quezon is absolutely opposed to the plan to let the Chinese remain armed after this war, and the Japanese entirely disarmed. “The Japanese could teach us civic virtues, but the Chinese only ‘trickery and corruption.’” Would prefer to have the Indians armed. Quezon says he finally converted Luce and Howard to this view, and Luce is going to advocate Philippine independence immediately after the war. Quezon is quite worn out by the strain of these arguments, conducted until 1:30 last night and for an hour this morning. He remains still greatly depressed by the views of Howard and Luce on the Philippines’ status after this war is over. He now sees that the final success of his life’s work really depends upon Roosevelt’s party remaining in power in Washington. Spoke of his troubles caused by the corruption by the Chinese in the Philippines. When a delegation from Chiang Kai-shek visited him he told them he sympathized with their desire of independence and hoped they would throw the Japanese out, but he did wish they would help him to curb Chinese corruption in the Philippines. The last Consul General they had in Manila was one of the “new young men” and he helped Quezon to clean up the immigration mess; and to put in jail the violators of that act. Quezon reorganized the Bureau of Immigration. He added that if he lives to attend the Peace Conference, he will work to see that China and Russia do not remain armed while Japan is disarmed. Hopes to line up Canada, Australia and the Latin American countries to that end. The most attractive, refined-looking woman present was the lady pilot, Mrs. Hilda Yen, who had flown her plane from Chungking via India and Africa. She had been as a child to school in the United States and could speak English perfectly, free from those humming, explosive noises indulged in by most Chinese when they are said to be talking in English. …The most serious issue of immediate post-war concern was, of course, Hong Kong. Did the Chinese insist upon its return after a century as a British colony? Was not the matter also of great importance to the trade of all the nations in the Western Pacific? Could we afford to lose this great free trade post? One of the English delegates put the matter very objectively and with much restraint. There was no answer from the Chinese. They sat silent, with poker faces. The foreign concessions at Shanghai present an almost equally thorny problem. A great imperial city has grown up on the mud flats so contemptuously given the European merchants long ago. In recent years, the Chinese have shown a decided intention to get them back, with all the fabulous riches which have been built up there. Two of the fears in the back of the minds of many Asiatic delegates were Chinese imperialism and American imperialism! One delegate let slip the statement that the people of the United States were imperialists and didn’t know it themselves. Perhaps he referred to our “Good Neighbour” policy towards South America which is compounded of an equal mixture of self-defense and exploitation. However, there is no need at present to worry about that since everyone knows that people seldom stay bought. There were no delegates present from any of the South American States which front on the Pacific! He added that the good will or support of Great Britain as well as of the United States would be needed in either eventuality. Thought Hong Kong should not be given back to China, but that the English should pay China the value of the barren island as it was when ceded to them, because of the disgraceful circumstances in which they got it. Quezon began by looking very tired, speaking slowly and reaching for his words in English. As he warmed up, he showed at his very best. Described the lunch of the day before at which he had entertained Mr. and Mrs. Henry Luce. Mrs. Luce is not enjoying her first days in Congress–the new member is usually treated with little consideration by the House. She could not get on the Committee on Foreign Affairs, etc. Quezon was much relieved to find that Mrs. Luce, who had been so very active in the propaganda for China, was now not in favour of entirely overthrowing the balance of power in Asia and of leaving Japan (as well as the rest of her neighbours) at the mercy of China…. …In the Philippine Government circles I find general anxiety over probably future aggressions by Russia and China. Many stories of Russian plundering of the elite in the part of Poland which they annexed. Quezon expressed himself as in favour of a balance of power in the Far East–that Japan should not be so crushed that China may arise in her place as the would-be dictator of the Orient. These entries are an interesting insight into past views on what were, back then, emerging questions: the post-colonial world that would emerge after World War II; attitudes towards an ally, China, and a foe, Japan. It is equally interesting to consider how some concerns have gone away, and how many remain. did not see Quezon this day; he had a Cabinet meeting for half an hour at 11:30 a.m. and then “slept” the rest of the day. Talked with Dr. Rotor and Bernstein. The latter says Quezon is emotionally very much upset with the editorials in Washington Post and Washington Star; and very angry with Lippman. Rotor says Quezon is always pessimistic towards the end of a political fight; he walks right up to an issue, fights every step with all his might and then becomes pessimistic over probable results. Bernstein added that since that conversation at Saranac at which we were present when Quezon told Osmeña that if the resolution were passed by November 15th he (Q.) would resign because he is ill, Bernstein had heard nothing more on the subject. He says that at the time Quezon was sincere, but he (B.) never believed that Quezon would quit. Talk with Resident Commissioner Elizalde who was more cordial than usual; he had helped Tydings to draw up the resolution as finally introduced. Thinks the idea inspiring and beautiful. Discussed with him the Mountbatten appointment; he said it was not done in order to interfere with MacArthur, but so as to have British forces reconquer their lost Asiatic colonies; thus they can hold them. Otherwise if done by Americans or under American Command the United States might insist on independence for these colonies. At least the United States would be embarrassed by the matter! Elizalde said also that General Marshall, Chief of Staff, did have a “run-in” with Churchill at Quebec –Marshall is no “yes man.” Elizalde insists that old General Pershing is in an army combination with Marshall, Admiral King and General MacArthur. This is the first entry in this diary for more than three months. Early in June, Quezon was attacked by bronchitis and soon developed a serious attack of tuberculosis. Dr. Trepp was frankly alarmed–he told me that Quezon was a worn-out man, and expressed himself as uncertain whether he could pull Quezon through this time. I suggested Saranac Lake, of which Trepp had never heard, but he understood at once when I mentioned the name of the famous Dr. Trudeau. So, after a couple of weeks in Washington and an equal period at Doctors’ Hospital in New York, Quezon was taken to Saranac. Before leaving Washington, Quezon was not allowed to speak above a whisper, and the Cabinet met in his bedroom, where the President designated Osmeña to act for him, and in case the latter was incapacitated (as he then was! ), Elizalde was to act as and for the President. This selection, inevitable as it was, created vast confusion among high officials–Quezon’s secretary, Dr. Rotor, and Bernstein, head of the Office of Special Services, were frankly uncertain whether they could (or would) get on with Elizalde! Meanwhile, Osmeña, who, as already noted, has been suddenly operated on for appendicitis, came through safely, and then developed an infection and a high temperature. The first two occasions when I visited him in his bed in Doctors’ Hospital in Washington, he could not speak–only moved his eyelids. I then thought he might die in my presence. My third visit, a fortnight later found him sitting up in a wheel chair and conversing agreeably; I told him he would soon be dancing again, and to clinch the matter he stood up and did a couple of fox-trot steps. He has been more or less acting as President ever since, somewhat to the surprise of Elizalde, who had expected Osmeña to be out of business for a year. Quezon’s 65th birthday was at Saranac on August 19, 1943; shortly after that I heard that he was going to send for me; a telegram on September 4, from Rotor asked me to go up to Saranac for a week. On arrival, I found all the customary “court circle” at MacMartin camp–Mrs. Quezon, the three children and all their usual suite. Osmeña and Bernstein were there, and Valdes and young Madrigal soon arrived. They were all gayer and in better spirits than I have seen them since their arrival in the United States in May, 1942. Quezon was said to have gained five pounds, and was contemplating an early return to Washington to escape the cold weather at Saranac. Trepp seemed resigned to the move, although he was enjoying himself in surroundings which reminded him of his native Switzerland. Quezon had the steam heat on in the house all summer, and part of his “outdoor” porch enclosed! I found Quezon still on his back in bed, he was obliged to talk in an unaccustomed low voice, and easily became tired. Osmeña, Bernstein and I were at once employed on several alternative forms for a joint resolution of Congress declaring that the Philippines were and of right ought to be free and independent, that independence was to be granted as soon as the invader was driven out of the Islands and was to be secured, and the United States was to make good the ravages of war. Quezon had received at Saranac a visit from Secretary of War Stimson on the latter’s journey to the Quebec conference. Stinson had been deeply disturbed by the Japanese political maneuvers in the Philippines (as, indeed I have been myself). They feared that the Japanese grant of independence might rally a certain number of Filipinos to aid the Japanese army to resist the coming American attack on them in the Philippines. Stimson told Quezon that if this occurred, he (S.) would feel like committing suicide. Millard Tydings, the Senator from Maryland, Chairman of the Committee on Tertitories etc., had been staying nearby with his father-in-law, ex-Ambassador Joseph E. Davies, and the two of them had come over to visit Quezon. Tydings then told Quezon that he would “father” “any damn thing” to which the President would agree in order to meet this situation. So, together with Osmeña and Bernstein, I worked for the first day on the various forms offered for the proposed joint resolution. We could see Quezon for only an hour in the morning and the same length of time in the afternoon. That night Osmeña and Bernstein returned south. Talk with Colonel Manuel Nieto, Quezon’s loyal friend and chief a.d.c. He told me that they had recently seen a colonel (American) who had escaped from the Philippines in July last. He reported that the Filipinos still have 10,000 troops in Mindanao; that there the Japanese held only Davao, Zamboanga, Misamis and the country up as far as Lake Lanao. The Filipinos can operate elsewhere in Mindanao as they wish. Tomas Confesor has a sort of government in existence in parts of Panay and adjoining islands; Samar and Leyte are for the most part unoccupied by the Japanese. Parts of Cebu are still in the hands of Filipino commandos; Luzon is pretty thoroughly occupied by the enemy. In conversation at lunch I condoled with Mrs. Marcos Roces over the death of her brother-in-law, my good friend Don Alejandro Roces. It seems that the news had been kept from her–I don’t know why! In talking over this with Quezon later he remarked “Roces was better dead than left alive to explain later his attitude in his newspapers (La Vanguardia, Taliba, etc.) which had been pro-Japanese from the moment the enemy occupied Manila.” Quezon added that he would not himself hang any of the pro-Japanese Filipinos upon his return, though he added that “some of them may be killed before we can take control.” The general impression is that the Filipino people can distinguish accurately between those who are really pro-Japanese and those who are merely co-operating formally to preserve what they can of their country. Quezon quoted again the cable he sent to Roosevelt before leaving for Corregidor, that “if a government cannot afford protection to its citizens it cannot claim their allegiance.” It seems that thereupon Roosevelt cabled MacArthur to release the Filipino Army if Quezon demanded it, but also cabled Quezon his famous message “promising to redeem and protect the Philippines and give them their independence.” Quezon added that he had changed the word “redeemed” when he issued to the Filipino people the proclamation publishing Roosevelt’s message, on the basis of which the Filipinos fought the battle of Bataan. Roosevelt did not know that MacArthur had showed Quezon the message allowing him to disband the Philippine Army if Quezon insisted. Quezon praised Roosevelt’s attitude very highly. He told me that Stimson’s recent visit to London was to insist that a more vigorous war be waged at once. Hence the pronouncements to that effect at the subsequent Quebec Conference. About the so-called “independence” offered by the Japanese to the Filipinos, Quezon said: “As soon as I heard that the voting was to be done only by members of the Kalibapi, all my anxieties were ended. If it had been a vote of the Filipino people I would never have gone against it–I would have resigned.” (As a matter of opinion, the Filipinos are said to have “adopted” the new constitution by the vote of 181 hand-picked members of the Kalibapi!) This attitude of Quezon toward his retention of the presidency is uncertain in my mind. When Osmeña and Bernstein left after handing him the various forms proposed for a joint resolution of Congress, Quezon in bidding good-bye to Osmeña said “If this resolution passes Congress before November 15th, I shall resign because I am ill.” Mrs. Quezon also told me that when they go back to Manila, it would not be to reside in Malacañan Palace, but in their own house! On the other hand, Trepp says that he knows Quezon is going to retain the presidency, since he has overheard the negotiations on that subject! Well, we shall see, what we shall see. Roosevelt and Stimson are already committed to the earlier proposition–i.e., independence as soon as the Japanese invader is thrown out. (The other form might look as if the United States were evading their obligations). It seems that Quezon has had Dr. Cherin, an assistant of Bernstein, working on the re-writing of Quezon’s book this summer, though Quezon told me nothing of that. The real hitch in publication is that Quezon cannot yet tell the full story of the all-important interchange of cablegrams between himself and Roosevelt before the battle of Bataan. Dr. Trepp tells me that Quezon is in very much better condition; that his blood pressure is down to 160–about right for his age; that the past week has been largely given up to interviews with Supreme Court Justices Murphy and Frankfurter, and when I saw Quezon he told me the “legal” position as to the Philippine Government-in-Exile (probably worked out by the two justices) viz. : that only authority since the Japanese occupied the Islands is President Roosevelt, and he will decide about any change in the person to head the Philippine Government-in-Exile. This assures Quezon of continuance in office until the Islands are re-occupied by the United States and a new election is held. This, however, is not the sole cause of Quezon’s good spirits and improved health; the allied victory in Tunisia has sent the barometer up again. Quezon says he has decided to give up his pressure of work as much as possible; no more evening work, and no more bridge. He is alone with his family in the evenings now; during the day he sees only those visitors absolutely necessary. Stays in bed as late as he can in the morning; has indefinitely postponed work on his book. Called Bernstein and me into conference about the future of the “Office of Special Services” at 1617 Massachusetts Avenue. Will not ask for deferment of draft of the Americans now in that office, since he says he does not feel that he has the right to do so. Bernstein, himself, is not asking for deferment (tells me of the example of what happened to several of the new-style “planners” in the Federal Government); he has evidently been made nervous by the strength of feeling in Congress. Bernstein will be drafted July 1st, and his assistant, Dr. Cherin, will probably get a commission this Summer. Bernstein had submitted to Quezon a memorandum on the future of the “Office of Special Services”–proposing that the head of it hereafter be given cabinet rank, proposing Dr. Rotor, the President’s Secretary, as head of this office. Quezon refused to consider this, said he could not give up any of Rotor’s time and duties as fixed at present. Quezon complimented Bernstein on his work and said that since he was leaving, he (Q.) had considered abolishing the rest of the office. But now he wished to put me in there to supervise this office–I spending half my time in Washington. It looks to me if Elizalde had been right in the very beginning (when Q. first made this suggestion to me early in December last) that I was to be a banana peel for Bernstein! Since then Bernstein has made very good, and it looks as if the transfer of Bernstein and of his second in command to the army would leave me as the banana peel for the rest of the office! Some talk in the antechamber of my going on Monday to the Hot Springs Conference with the Philippine delegation, but shortly afterwards they managed to get in touch with General Basilio Valdes, so he came East at once by plane to join the delegation–thus making it all-Filipino, as it ought to be. The letter Quezon was drafting when I left, in which he asked the President’s support for a joint resolution of Congress declaring the Philippines “are and of right ought to be free and independent” was never sent. Instead he saw the President just back from his trip to the Casablanca Conference. Result was that the State Department sent him a memorandum that the appointment of Quezon to the Pacific War Council and his being asked to sign the United Nations Declaration was the equivalent of recognition by the American President of the Philippines as an independent nation. Obviously, they decided that the proposed Congressional joint resolution would be ridiculed by the Japanese when they were in occupation of the Islands. Legally the President has no power to free the Islands while they are still–nominally, at least,–a possession of the United States. But Quezon seems to be satisfied with the decision. (At least, it is a suspension of the constitution of the Commonwealth, and as such, leaves Quezon in command as head of that State until further constitutional action is taken, and thus averts the succession of Osmena to the Presidency of the Commonwealth on November 15th next. This, I believe, the President of the United States has a legal right to do). Quezon’s radio address given out by the Office of War Information on February 20th, dealing with the announcement of this decision, was really excellent. This was broadcast using short wave facilities of the Office of War Information for the Philippines and other parts of the world. Quezon asked me to read over the papers in the proposed contract to film his book, which Warner Bros’ offer–Morgan Shuster advises him to get a “radio lawyer” to protect his interests, and points out that the form of contract only guarantees that the “basic story” shall be under his control; that it would thus be possible for the movie company to present Quezon’s personality and his life story in a manner derogatory to his dignity. Probably Shuster’s anxiety is well founded; no doubt he welcomes a prospect of getting Quezon to finish his book, but his first concern is to protect him. Quezon had accepted an invitation to speak on March 19th before the National Republican Club of New York. Now he proposes to go away to “California” for the purpose of “protecting his health”–he would thus break the engagement. I try to persuade him at all costs to keep this date–in view of the growing power of the Republican party, he could not afford for the sake of his country and of himself to break it. He should go there and try to capture the good will of those important men as he did that of the Maryland Bar Association. He seems firmly of the opinion that he can go away on a vacation–is this a result of, or possibly influenced by, his recent conversation with President Roosevelt? Quezon showed me a letter he was drafting to MacArthur about the management of the guerrilla campaign in the Philippines which is charge of Lt. Col. Peralta. Quezon resented the General’s trying to appoint civilian, as well as military officials–such as Confesor as Governor of Iloilo. Tells MacArthur that the young flying hero Villamor is on his way out there, and should be entrusted with such affairs. That we must be careful not to treat those Filipinos who are co-operating with the Japanese as if they were traitors–that attitude might really make them so. Says that some of those who had entered the enemy’s service helped these two young American officers to get through the Japanese lines and escape in August. The guerrilla depredations on Filipinos living in the towns in the north must be stopped. Many of those who have accepted military service with the Japanese will later use the rifles given them now against the Japanese when we return. Laments the fate of Manuel Roxas in falling into the hands of the Japanese. If they have murdered him for refusal to accept free the Presidency (he refused three times) he adds “I do not know how many generations it will take for our race to produce another Manuel Roxas.” Recommends that Roxas be made a Major General by MacArthur. Says that “Chick” Parsons is the best man to keep the Filipinos in line–he is now on his way back there. At luncheon Quezon told us he had just received a call from M. Willoquet, French Consul to Manila, who left there last June. He said the Japanese were trying to marry George Vargas’ daughter to one of their army officers. More about Manuel Roxas. Quezon forbids Bernstein to make public the fact that Roxas is in the hands of the Japanese. If still alive he is being pressed by the Japanese to accept the presidency. To stir up news about him might only result in his death. If he had accepted their invitation to become President of an “independent” Philippines (under the Japanese) this might even now be an accomplished fact. If he persists in his refusal, “he has only done what I wanted him to do–show the Japanese we would have none of them.” Roxas was taken out in an airplane from Mindanao in November; nobody knows where he is now–probably in Fort Santiago. The Japanese have been rounding up schoolteachers who were not conforme and putting them in Fort Santiago, just as the Spanish did–they probably shoot them there. Consul Willoquet, who was French Consul at Manila, and was put in prison by the Japanese for being a Gaulliste, was released on threats by de Gaulle of reprisals on the 4,000 Japanese, who are prisoners in North Africa. He says that whereas Vargas could get no favours from the Japanese such as release of a prisoner, it is evident that Aguinaldo is really “sold” to them. Willoquet, who saw de Gaulle in London, says the Free French are planning independence for Indo-China. Office of War Information reports a Japanese broadcast from Manila calling a convention there of all provincial and municipal officials to be addressed first by Vargas and next by the Japanese spokesman. A three point programme: (1) Independence at earliest possible moment. (2) Economic rehabilitation. (3) “Cultural Questions”–such as cutting off completely from the previous regime. Long discussion on India with Quezon, (Osmeña and Bernstein present). Quezon is considered an authority on this subject. P.M. says he is the man to send there to settle it all. Quezon thinks the Cripps Mission brought about some sort of an agreement with the Indian nationalists, but the Viceroy (Linlithgow) and General Wavell took no part in the discussions. “If Gandhi dies, we may expect a wide-scale revolt.” Quezon thinks the loss of India would finish off for good the whites in the Far East and destroy hope of restitution of the Philippines. That China will then be forces to submit to Japan, since she will be shut off for good. The question is: will the Indian army stand by the English? It is understood that Roosevelt reads only the New York Times in the morning and P.M. in the afternoon. Morning at Elizalde’s office, discussing with him, Ugarte and Zafra preparation of our official report on the recent international conference at Mont Tremblant. Also talk with Elizalde on the subject of Bernstein–he was very much upset because they already had a budget for that office of $150,000–and no Filipinos were on the staff, except a recently appointed librarian. Says that Quezon has had no publicity since Bernstein took over two months ago. Cited his Saturday night speech in Baltimore which did not appear in the papers. The fact was, however, as Quezon told me, that he did not deliver his speech as prepared because he looked over the audience of the Maryland Bar Association, and listened to their dull chairman, and decided they needed a stronger and more personal address than he had prepared. He added that it was the “toughest looking” audience he ever faced, so he started off “on his own” and gave it to them “hot from the griddle.” I am told he had them applauding wildly and won rather an ovation. At lunch with Quezon, Mr. and Mrs. Andres Soriano, and two important Pacific Coast magnates with their wives decked out in valuable furs and new gowns. Quezon began by looking very tired, speaking slowly and reaching for his words in English. As he warmed up, he showed at his very best. Described the lunch of the day before at which he had entertained Mr. and Mrs. Henry Luce. Mrs. Luce is not enjoying her first days in Congress–the new member is usually treated with little consideration by the House. She could not get on the Committee on Foreign Affairs, etc. Quezon was much relieved to find that Mrs. Luce, who had been so very active in the propaganda for China, was now not in favour of entirely overthrowing the balance of power in Asia and of leaving Japan (as well as the rest of her neighbours) at the mercy of China. He told again, and told well, the story of his last address to the students of the University of the Philippines one week before the Japanese struck. One of the guests present today was a California contractor who had been employed by the Navy a year before Pearl Harbor to extend Cavite airport and other posts in the Pacific islands. Quezon told him how A. D. Williams disputed with the Navy over the extension of Cavite airfield and urged that extra fields, well camouflaged, should be constructed instead. But both Navy and Army authorities refused to listen to him. I spent Monday morning and all day Tuesday in Elizalde’s office, working with him, Rotor, Ugarte and Zafra on the preparation of our formal report as delegates to the Institute of Pacific Relations last month at Mont Tremblant, Quebec. Very interesting discussions and really entertaining. When we were alone, I asked Elizalde, whether he had read Romulo’s book, I saw the Fall of the Philippines. He said: “Yes, I read it twice–it is bunk.” I inquired what it was that Quezon had objected to–he replied: “First because he put MacArthur ahead of Quezon all the time, and then because he had put in a full list of the persons whom Quezon took with him to safety from Corregidor; such people as Valdes, Major (Dr.) Cruz, Ah Dong, his personal servant, etc.” Elizalde says he left more important persons behind–should have ordered Manuel Roxas to come to Australia with him instead of consenting to his staying behind; that Romulo was obliged to have the book recast and to pay $1,800 to the publishers for resetting, renumbering the pages etc. This came out of his first payment of $2,500. That the blackouts in the book were really at the instance of the War Department; they were left in the book to add importance to it. Romulo has sold already 25,000 copies–will probably get $20,000 out of the book. In the Philippine Government circles I find general anxiety over probably future aggressions by Russia and China. Many stories of Russian plundering of the elite in the part of Poland which they annexed. Quezon is still planning to go in about two weeks to Phoenix, Arizona, and invites me to accompany him for a couple of weeks. Intends to stay there a month or six weeks. I wonder? Quezon very friendly and gracious–perhaps making up for the incident of the week before, when, knowing that I was coming from Charlottesville on his request, he let me make the journey without sending me word that he was going to New York! Dr. Trepp says this is characteristic–that he often shows no consideration whatever, especially when he changes his own plans! Trepp does not know whether Quezon will really go to Arizona–his health would do equally well in Washington. Was under the weather in New York. His family spent the time in shopping, theatres and the opera; Quezon stayed only in his apartments in the Waldorf-Astoria. Had one visit each from Roy Howard and Morgan Shuster. Quezon has on his desk a bound notebook containing the proof sheets of his (unfinished) book. Took it up for 15 minutes with me, and got me to write an additional page concerning his childhood at Baler, and then started our bridge game which lasted the rest of the afternoon and until one o’clock in the morning–“wild cat” bridge, in the Filipino fashion, with precious little of partnership in it. Bernstein then presented the question of a movie drama in Hollywood, now in course of preparation, showing an American nurse and an American officer’s adventures on Bataan. A Filipino doctor had been proposed, and Romulo considered it, and insisted that he should appear as himself! Quezon said quietly that Romulo did not look sufficiently like a Filipino–was more like a Chinese. Proponed Dr Diño, his personal physician instead–said he was a real Malay type and also had had previous experience of acting. Knowing as I did, from another source, of the terrific row Romulo and Quezon had recently had over Romulo’s book I saw the Fall of the Philippines, I was somewhat diverted by this calm discussion. Quezon had been so angry with Romulo that he had told him, “to get the hell out of here, and never come back” and had deprived him of his uniform as a Lieutenant Colonel of the Philippine Army when he was on the lecture platform. Quezon takes an especial pleasure in spending money, due, no doubt, to his cramped childhood in Baler. He remarked that he had paid the Shoreham Hotel $20,000 (Trepp says it was $60,000–he had seen the bills) this year for redecorating the suite he and his family occupy! This sort of thing, in my opinion, constitutes a political danger of considerable menace. Then Bernstein took up with him the idea that Quezon’s own life should be the story of a Hollywood film. Some tentative discussion on this. If he had published his book, the film could be based on that. Personally, I dread the vulgarizing of this whole chapter of Philippine history by those fellows in Hollywood. Long discussion between Quezon, Secretary of Finance Andres Soriano, Foley, head of New York branch of Philippine National Bank, and the Auditor General Jaime Hernandez. The National City Bank of New York asks payment of 200,000 pesos turned over December 27, 1941, while Manila was being bombed, to the Insular Treasurer for transmission by telegraphic transfer to New York. The National City Bank holds a microfilm of the Insular Treasurer’s receipt, but nobody knows what happened to the original since the destruction of part of the Intendencia building by Japanese bombs. Auditor Hernandez opposed the payment now, in view of the uncertainty as to the facts. Quezon upheld him and seemed justly proud of the character and independence of his Filipino auditor. Quezon gave me several stories from the inside talk of the United States Supreme Court, which he gets from Justice Murphy and Justice Frankfurter; incidents illustrating the very high esteem in which the Filipinos are now held in America. Arrived in answer to a telegram asking me to come as soon as I could. Quezon was looking very well and in good spirits. Told me he was going down to Arizona in about two weeks and “if he hadn’t finished his by that time he wanted me to accompany him for ten days or so.” No signs here of any work on his book. Dr. Trepp insists he had not worked on it “for months.” Elizalde told me en route to Canada that Bernstein was writing Quezon’s book for him; that he heard Quezon direct Canceran to turn over the ms. to Bernstein. Trepp thinks not. I asked Trepp why Quezon had so entirely neglected my draft of his book; Trepp did not know–thought possibly it had not been sufficiently eulogistic! I also had a talk with Dr Trepp, his Swiss doctor. Says Quezon does not really need him now; his TB is so well under control, he can live anywhere he likes. Says he feels like a mere lackey of Quezon; there is no real work for him to do. Would like to get a job on the staff of a sanitorium. Has come to the conclusion that Switzerland is the only real democracy he knows. There is not an ounce of democracy in the Philippines–even a businessman there has no chance unless he is a Quezon man. I also had a short chat with Quezon on past events in the Philippines. He said Governor General Luke Wright was all right, but his influence was impaired by the very anti-Filipino attitude of his wife. Told me how he had taken Sumulong, Rodriguez, etc., away from General Wood, and then the latter threw up his hands. Quezon organized a Supreme Council of the Philippines and gave the pro-Wood Filipinos an equal representation on it with his own partisans. He, Quezon, presided but had no vote–still they all followed him obediently and without a question. Dr. Pardo Tavera, a distinguished member of the first Philippine Commission, was patriotically against independence; he wanted the United States to remain there for the sake of the Philippines. Still, he was so independent-minded himself that he continually opposed the Governor General and really forced himself out of the Philippine Commission. Quezon thinks Admiral Leahy arranged for the occupation of North Africa, but when he was “recalled” from Vichy he was really getting out before the Nazis could seize him and treat him as a spy. Luncheon with the two United States Army captains, who escaped with extreme hardship from the Philippines in August and made their way to Australia. Splendid chaps: they are longing to get back to fight the Japanese and don’t wish to be sent anywhere else, even to North Africa! One had been in Batangas and one in Mindoro, and tho every Filipino in each of those provinces knew where they were, nobody gave them away to the Japanese. Instead, they sheltered and fed them and gave them the small boat in which they finally got away together. They reported that there are believed to be only 20,000 Japanese in the Philippines now. They stick to their garrisons, or to the big cities, or to the camino real. The Filipino protector of the captain who was in Batangas came and went to Manila whenever he wished. He repeated a conversation with a Japanese colonel who spoke Spanish well: this colonel confessed that the Japanese knew from the beginning that they could not win this war. The two officers agreed that there were many Americans –soldiers and civilians, at large and in hiding in the Philippines. They said the Filipinos had remained perfectly loyal, but one of them added that he was not sure they would all continue so if the situation were prolonged indefinitely without relief. Quezon was much gratified to have them say that the Filipinos were perfectly loyal to him, and had not blamed him for his escape from the islands –that they understood the necessity for this. He stated again that when MacArthur pressed him to go to Corregidor, he had resisted and then finally been persuaded. He had sent for General Francisco, who told him that with 1,500 of the Constabulary soldiers he could keep Quezon perfectly safe indefinitely in the mountains of Rizal; he knew every foot of those wild mountains; that if they gave him enough machine guns he could continue to harry the Japanese and inflict great damage on them. MacArthur vetoed this suggestion. Quezon said no Filipino would ever have given his hiding place away. I remarked that they did do so in the case of Aguinaldo and he replied that Aguinaldo had been guilty of great crimes and misdemeanors. He also remarked that like Governor General Murphy, he had never allowed the death sentence to be inflicted –he hated the idea of putting a man to death in “cold blood”!